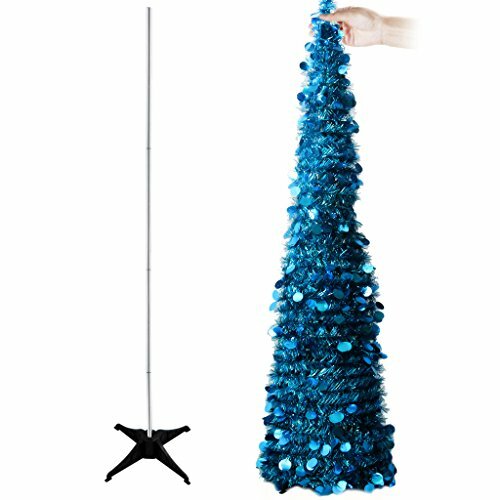 ※【GLISTENING】：It is a 5ft collapsible tree,great for Christmas party decorations.It collapses down flat,pull-up,cutest and most practical tree ever,nice little corner tree - something to brighten up a corner.and beautiful.And can be recycled everytime. ※【SIMPLE】: And easy to assemble, no tools needed,features a pull-up design for effortless christmas preparations.And takes up little space, good color and luster, easy to store, resusable. ※【ACCOMPANY】: Stop stressing about the traditional Christmas trees that are difficult to carry around. Our Christmas collapses down into a tiny shape for convenient storage for the rest of the year. ※【COLOURFUL TREES】:We have 5 colourful christmas trees.Our decorated Christmas tree is loaded with glittering sequins to give you a lively theme for your Christmas celebrations.Also it can be a great gift. ※【SASTIFACTION GUARANTEE】: We are proud of our artificial christmas tree and we're certain you'll love it as much as we do. If for whatever reason you are not satisfied contact us for a full refund. Buy with confidence and peace of mind! If you have any questions about this product by YuQi, contact us by completing and submitting the form below. If you are looking for a specif part number, please include it with your message.